Despite the drought, we are blessed with the lion’s share of fresh produce here in Southern California, which calls for a light, refreshing menu on a hot summer evening. Today, I am making Hugh’s caponata for our Cottage Cooking Club. I love surprises, but this one was a bit of a jaw-dropper. I thought I knew all there was to know about chocolate and this Italian classic, but the two together? I might have to think about that for a bit while, as my little Daisy likes to say. 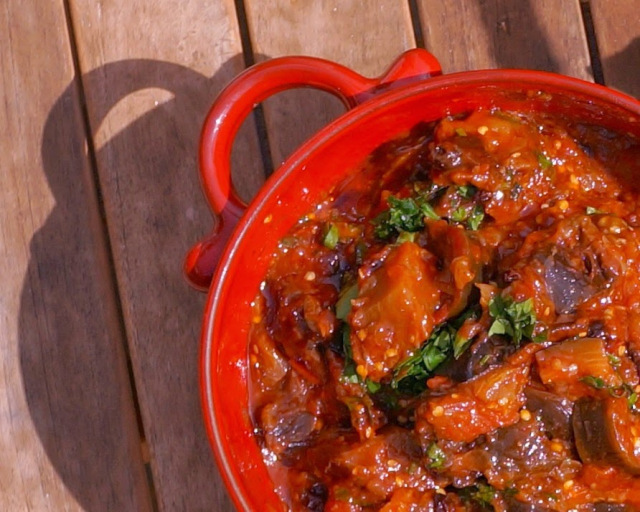 Classic caponata is a versatile melange of some of summer’s best crops. Warmed or chilled, as a main, dip, side or salad, it adjusts beautifully to suit your mood. Make it a light spa dish with some quinoa and fluffy rice or serve it as a dip at your next cocktail party. An old world technique for cooking with eggplants always begins with salting them. The belief is that any bitter flavour is extracted when the eggplant is sliced, then salted so that the “poison” sweats out. Hugh follows this tradition with the same instructions in his own recipe. There is nothing more disappointing than seeing a beautiful bowl of caponata and taking that first bitter bite. With very little time slaving over a hot stove, this particular recipe is truly a godsend to make on a balmy summer evening. After the onions are sautéed sweet and golden, there is nothing to do at the stove but a slow simmer. Use fresh tomatoes if they are available, especially homegrown or organic varieties as they are the tastiest. Mine has a base of imported San Marzanos from the jar. (Nix canned tomatoes). The brown sugar and raisins paired with vinegar give the salad its signature sweet-tart taste, but chocolate?! I just cannot wrap my head around that one. There was no mention of chocolate in my aunt’s recipe. But, I am willing to try almost anything from the Cottage cookbook at least once and that Lindt in my pantry may have just found a new purpose. Wash and slice the eggplants into disks of about 1/2-inch thickness and collect them in a colander. Sprinkle a generous amount of salt over the eggplant and toss gently with your hands to coat evenly. Do not use coarse sea salt as the eggplant will not absorb it properly. Allow the eggplants to rest in the colander for about 15 minutes. Rinse the capers to remove the excess salt and set aside. Meanwhile, place a deep pot over medium-high heat and drizzle the bottom with olive oil. Mince garlic and set aside (at least 10 minutes). Add garlic to the pot and cook for a few minutes. Rinse the eggplant and add to the pot. to simmer about 15 minutes. Add the currants, capers and chocolate (if you are brave). Place the lid onto the pot and simmer another 15 minutes. Remove from the heat and allow the salad to cool completely. Rinse and chop the fresh parsley and add to the salad. Mix gently to combine. The bay leaves are not in Hugh’s recipe, but were a shoe-in as we have a laurel plant in our backyard and its delicate flavour is always welcome. There were a couple of ingredients in his ingredient list that I must confess I omitted. The celery was left out, simply because the stalk in the fridge was not as fresh as I remembered. The olives also did not make it, because, I had been a bit heavy-handed with the salt, in typical Coco fashion. As for the chocolate, I took one deep breath, closed my eyes and tossed a bit into the mix, just as Hugh instructed. Because the 80% cocoa bars do not have a lot of sugar, the dark chocolate melts into the caponata and imparts the most interesting hint of flavour that will forever keep your guests wondering about your secret ingredient. This saucy little number is a beautiful make-ahead dish that tastes even better the next day. Whatever your venue, whether you are planning a small get-together, a big party or just a weeknight meal, it always finds a place at your table. A beautiful blend of salty, creamy, chewy, sweet, tangy, caponata might convince you that you have a smidge of Italian blood flowing in your veins. *Morkoor is the Armenian term for aunt, literally translated to “mother’s sister.” Horkoor also mean aunt, but on the father’s side. That’s your little language lesson for the day. Don’t say I never teach you anything. Coco, oh my goodness that looks amazing! I wish your could make it for me. I still have to try your cake, I need to devote a weekend to your recipes! I love your photos, I need to sit and read the post, I'm sure it will be interesting since it looks like this it is a family tradition! Thanks for the post and the great music!!! Hi Coco, what an amazing recipe, love that you added chocolate. The music is such a great touch. Really enjoying the Cottage Club recipes! Coco, that looks so delicious…..the first photo in particular has my mouth watering! I thought the raisins were an unusual addition (though I like that you substituted currants) and hadn't even noticed the chocolate in the recipe. Lovely wholesome recipe my friend – I wish uni would lay off so I had time to bake more! Colette, looks like you really enjoyed Hugh´s Caponata – the addition of chocolate in this recipe is based on a traditional caponata called “Caponata San Bernadino”, a recipe created by monks in Catania, Sicily. Sometimes the caponata is served with a sprinkling of dark chocolate, sometimes even with a dark chocolate sauce. But be that as it may, your caponata looks utterly delicious and I am quite happy that you keep enjoying cooking along with us! Thank you for your enthusiastic participation in the Cottage Cooking Club! Love that last photo! The caponata was my favorite of the month – a tie with the tahini-dressed zucchini and green bean salad. Lovely post. The caponata sounds fantastic. I'm having trouble imagining the chocolate in there, but I guess I'll just have to try it for myself. I enjoyed cooking from this book as a guest this month. I'm enjoying reading about the recipes I didn't make. They all sounded so good. What gorgeous pictures of a luscious dish! The hint of chocolate in there sounds intriguing – it's one of the recipes I didn't try this month. And thanks for sharing the lovely memories of your aunt. Food is the best memory-keeper, isn't it? I notice that there is chocolate in this beautiful eggplant dish!!! What an interesting addition!